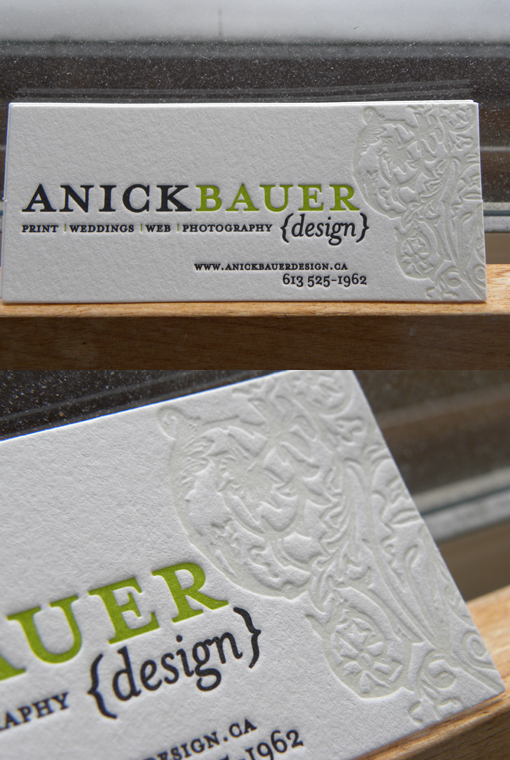 Fabulous business card designed by Anick Bauer and printed by We Do Printing. It is letterpress printed in 3 colours on a Heidelberg Windmill and die-cut into a skinny 3.5 x 1.5 rectangle. Originally the pattern was to be a blind deboss but we found that adding a bit of transparent white ink into the press brought out the details. It is printed on Crane's Lettra 300gsm cotton paper-our fave paper for business cards! Check out http://www.wedoprinting.net for details on ordering your own letterpress stationery.